I’m giving you the actual exercise I gave to the employees in the customer service training I delivered this morning, along with the discussion questions I used. If you’d like an excellent training activity that helps employees convey empathy, print off this exercise and facilitate a short discussion with your team. Instructions: Read the following silently and once everyone in your group has read the Blue Apron response, discuss the questions at the bottom of this page. Have you heard of Blue Apron? It’s a grocery delivery service, basically. You get recipes and perfectly proportioned ingredients sent to you and all you have to do is whip up gourmet meals in your kitchen. I use services like this literally every week. I just don’t have time to grocery shop with my busy kids and my travel schedule. Well, the first time I tried Blue Apron, my food box came with a little problem. My bag of lentils had a small hole in it, and the lentils spilled. Thanks for reaching out about this issue, Myra. I’m so disappointed to hear that your lentils spilled during transit. I hate to think that you won’t be able to fully enjoy your meals, and had this mess to clean. I’ve sent your feedback over to my Quality team -and this feedback will help us ensure that this won’t happen in the future. I wish I could help clean this up myself, however, as an apology, I’ve applied a credit for $19.98 toward a future order. To see this credit reflected on your account, you can click on the calendar date for your upcoming order in the “Delivery Schedule” section of the “My Account” page on our website. I know this isn’t the same as receiving a perfect shipment in the first place. However, I hope it can still give us the chance to show you a better experience. How did Tori acknowledge Myra’s concern/convey empathy? How, specifically, did Tori own the result in her response? 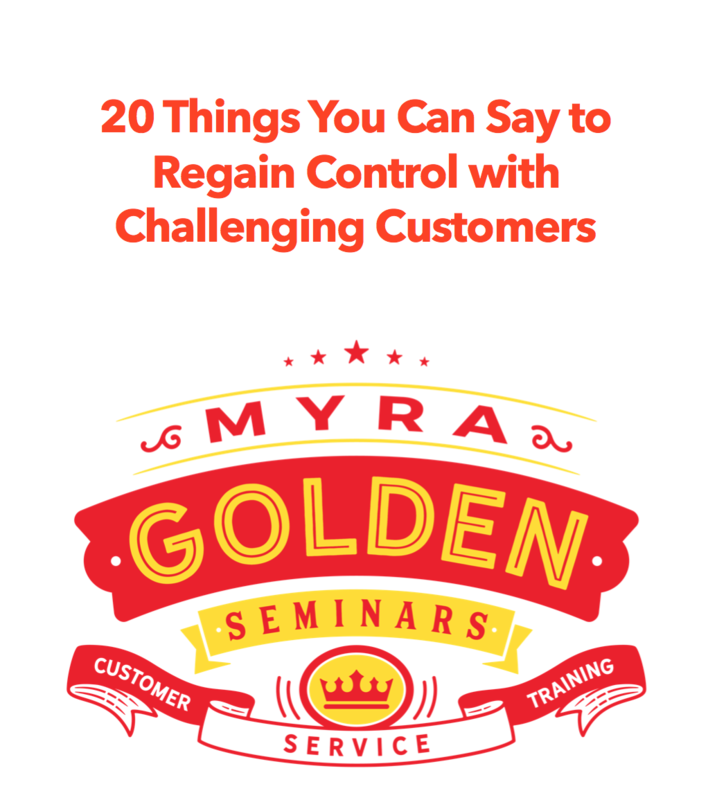 Identify a common problem you hear from your customers. How could you respond to this issue in such a way that you both convey empathy and you own the result? Write out points you would make to express empathy and own the result. Be prepared to share your responses with the large group. You might also like Here are 4 of the Video Clips I Show in My Empathy Workshops. Hi, Jennifer! I do this a lot. I’ll say, “The person with the most siblings,” or “The person who last drank wine.” It gets a little laughter and makes the training even more fun! Thank you for taking the time to read this post, and to comment!